Based on reviews from 4,766 users. 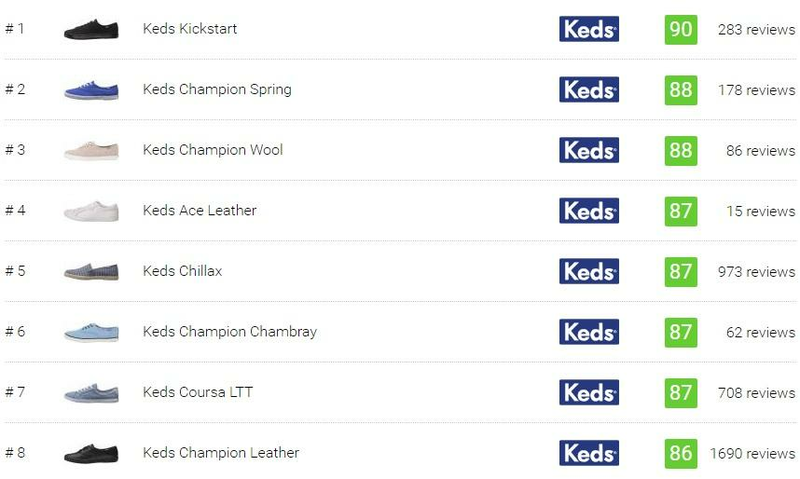 Learn how our rankings work or see our guide to Keds sneakers. Updated Apr 2019. Even though Keds sneakers are not the typical footwear that most sneakerheads line up to on limited-edition releases, it proved, through its more than 100 years of existence, that it is not a trend that comes and goes but a staple on each girl's closet. Its releases may not be as frequent and as many especially when compared to athletic footwear brands like Nike and Adidas, but most of it are guaranteed to be style-relevant through another 100 years. 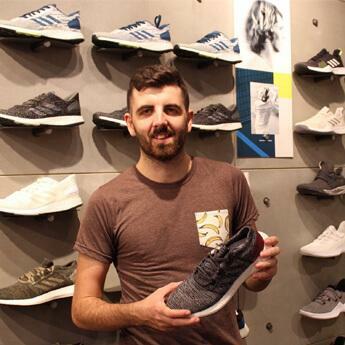 It is no wonder that in the sneaker realm, the competition is considered quite as each brand has something to boast—from delving into technologies, more complicated designs or partnering with the most famous personality. Keds shoes, however, knows that its greatest strength lies in its simplicity. Keds Champion – If there is one sneaker that catapulted the brand into success, it is the Champion. In fact, if there can only be one model that can epitomize the brand, it will again be the Champion. The canvas upper and the rubber-soles seems to be extremely simple and almost dull, primarily because of the sea of canvas sneakers that we are used to seeing, but Keds only proves that nothing can beat the Original. Keds Kickstart – Although it looks like the perfect summer sneakers, the adaptable Kickstart can guarantee to transition your outfit across all seasons. These Keds sneakers have six eyelets to secure the fit and an Ortholite footbed for superior comfort. Keds Triple Decker – Pushing the envelopes of the classic slip-on further is the Keds Triple Decker. Fashioned with a one inch platform, these sneakers gives the necessary height boot and comfort required by every fashionista. Most people have that perception that Keds shoes only sport a canvas upper and rubber soles. This, however, is not always the case as the brand also plays with different materials and makes use of these advantages. Canvas – Probably the most popular because it has been used for the longest time, canvas is known for its lightweight, breathable, and easy to clean properties. Leather – Known for its durability, leather is a popular material upper not only for Keds but for other footwear brands as well. Just like canvas, leather is also easy to clean and breathable. Mesh – If there one material that holds maximum power in breathability, mesh is the way to go. It is also known for its breathability and with regards to style; it also provides an interesting play of texture to any shoe. Jersey – This type of material is a kind of another type of textile, only it is has a most stretchy property. Just like canvas, jersey is a breathable, lightweight, and an easy-to-clean material. Examples of Keds shoes with jersey uppers: Champion Twill Stripe Jersey, and Triple Cross Jersey. Although identifiable with certain silhouettes, Keds offers many models and these can be differentiated through the cut. Below are some of the low-top and high-top silhouettes and examples to help you understand more about the difference of each. Ace Leather – Polished at the front, party at the back is the best description for these Keds sneakers. It sports a just a subtle pop of color to carry slight quirkiness and still maintain the casual-sporty look. The all-leather Ace Leather from Keds provides a more polished elegance compare to the more relaxed appeal of a canvas. Vollie II – The sporty yet sleek vibe of the Vollie II makes the feet look daintier and slimmer. Since it is infused with an Ortholite footbed and a padded collar, comfort is not compromised quality for this pair. Champion Cotton Sateen – Combining the casual style from the Champion profile and the lustrous and refined look of sateen, these sneakers are the perfect pair to use when you want to step up your sneaker game. DriftKick Heathered Mesh – Based on the look of these, it certainly is a bold look released from the brand. Don't let the fixed elastic lacing fool you because it has an easy-wear style that comes conveniently when always on the go. Crashback Leather – These sneakers provides the answer to every girl's problem of finding the right shoe that will seamlessly pair with every outfit. The classic and timeless style of the Crashback Leather allows women makes it the perfect pair to be used from day to night. Chillax – There can be no better way to name this pair other than Chillax. Despite delivering comfort, these Keds sneakers ooze a relaxed feel because of its washed twill upper and lace-less design. Flatform – If there's one thing to know about Keds, it is that it is not one to sacrifice comfort. Although not a lot appreciates this kind of style, flatforms are every petite girl's answer to getting the additional height without sacrificing comfort. Keds Triple Kick Tassel– These shoes scream everything about the tropics and summer. The flatform style shows an interesting play of sporty and casual, with a dash of uniqueness especially with the colorful and flirty tassels dangling on the laces. Triple Kick Jute – This footwear gets the styling of an espadrille and extra platform height. The jute across the sole provides texture and a unique play of injecting summer into the whole silhouette of the shoe. Scout Chukka Splash Twill – These Keds shoes are the revamped version of the popular Scout Boot. Although it is in a mid-top version, it doesn't mean that these sneakers deliver only halfway on style and comfort. The twill upper with polyurethane coating makes these water-repellant turning it into a functional and weather-resistant piece. Scout Boot Splash Twill - When the rain comes, it's time to take out the Scout Boot Splash Twill. Made of stain and water repellant PU-coated twill, these sneakers will prove that no rain can stop a girl. Its rugged outsole and cozy lining can also transition through the winter and bring chicness even at the darkest clouds. Kickstart Hi Metallic Linen – When a basketball sneaker gets injected with some femininity, the result is the Kickstart Hi Metallic Linen. The seven eyelets deliver major foot lockdown, and the Ortholite insoles heighten its comfort. The metallic upper gives a more girly and unexpected twist to any outfit without overly attracting attention. Dubbed as one of the fastest growing companies in 2014, Rifle Paper Co. is a lifestyle company that offers notebooks, greeting cards, stationery, journals, and phone cases. The simple and versatile profile of Keds sneakers could not be a better canvas to showcase the whimsical and spring-ready patterns that is Rifle Paper's trademark. The collection includes three of Keds' models—Triple Decker Lovely Embroidery, Kickstart Hi Juliet Floral, and Champion Lively Floral. All of these sport different playful prints, offered at prices ranging from $55-$60. The several collections released by Keds and Kate Spade show the strong partnership between the two brands. These series of releases only show how both brands complement each other as they can produce outstanding pieces that never fails to excite the fans. From chevron, polka dots, gingham, and nautical stripes, it seems like they have done it all, only to prove us wrong when the next collection comes. The New York Champion and Kickstart Glitter are two fine examples. Keds, being known for its women-empowerment campaigns, takes a playful spin on this through the Little Miss collaboration. Our childhood favorite, created by British author Roger Hargreaves, features the different roles of the modern woman. The limited-edition capsule features three of the Little Miss characters, all exuding key messages like leadership, optimism, and knowledge. Five Keds sneakers are housed on classic silhouettes- Champion, Triple Decker, and Triple. Because Keds will surely empower women, this collaboration with Frech textile designer Malhia Kent is certainly bound to happen. Keds sneakers included in the line are revamped silhouettes of the Champion, Triple Decker, and Slip-on. Bringing her expertise to the table, each pair is clad with woven fabrics and basket-like weaves with golden eyelets. Famous not just on her singing and acting career, Taylor Swift has been known for her effortless and chic style which highly complements the message that Keds portray on its sneakers. The collection includes 12 designs of the Champion sneakers are fun and easy to wear and speaks highly of the artist's favorite things. Because of its success, Footwear Plus distinguished Taylor Swift x Keds as 2014’s Best Collaboration. Just when you thought that sneakers could only be worn on the court or on the streets, Keds and Kate Spade demonstrates that it can also be worn on the aisle. Launched in more than 30 designs, each woman will have a wide variety of options whether she is the bride, bridesmaid, maid of honor, or simply a guest. Each piece has its own striking feature as they are clad in pearls, glitters, and floral appliques. These Keds sneakers are kept versatile to suit most of the themes required. In celebration of the brand’s legacy of releasing the first ever tennis shoe for women and its continuous commemoration for women, the company released a collection for International Women’s Day. These limited-edition Keds sneakers are all clad in a light purple upper called Purple Iris which is the 2018 Color of the Year and the International Women’s Day color. Well-known for its canvas uppers, the Studio collection steps up the expansion of their athleisure line with the Studio Collection. This line connects the brand’s years of shoe designing solely for ladies and the modern woman’s needs, wants, and expectations, according to Keds’ president Gillian Meek. Keds sneakers included in this are the lightest that the company has ever produced. If the Studio can be placed into a formula, it consists of a blend of breathable, lightweight, and soft jersey and mesh and contoured and perforated footbeds. Not only making shoes for women, the Ladies for Ladies collection also aims to support women by highlighting the Keds sneakers produced by them. The goal of the collection seeks on producing three to five collaborations a year and targets emerging influencers and business women. Though not the primary objective, the Ladies of Ladies brings fresh content and bridges the label to different types of consumers. We wouldn't actually know if this drove Kate Spade into creating a bridal line with the brand, but we certainly know that Yoko Ono is one unconventional lady for being married in Keds sneakers in 1969. John Lennon's wife paired the shoe with a wide-brimmed hat, mini skirt, shirt, and knee-high socks. If there is anything that she kept traditional about the whole outfit is that everything is in white. During the 1950s, most of the kids were glued to the television. To reach to their audience, the brand released a commercial featuring Kedso, an animated clown, and Keds’ mascot. The Ramones has been known to have worn nothing but Converse. It can be quite obvious as the sneaker exudes an attitude that matches the style of the punk rock band. However, based on one interview, Tonny Ramone confessed that Keds sneakers were the first footwear that they were wearing Keds during their initial years. During the1930s, there was a sole division for the women's line called Kedettes. Aside from Keds sneakers, the line features different styles like espadrilles, oxfords, wedges and more. If Keds has a brother, his name would be Pro-Keds. Launched in 1949, the Pro-Keds was primarily intended for basketball and became very popular during the 1970s. Clash By Night (1952) – Marilyn Monroe wore a black Champion. Now and Then (1995) – Characters Teeny and Roberta, played by Thora Birch and Christina Ricci respectively, were often seen wearing Champion throughout the film. The Aviator (2004) – Playing the character of aviator and movie director Howard Hughes, Leonardo DiCaprio can be spotted in Keds sneakers that was launched during the 1920’s named the Triumph. Two for the Road (1967) – Starring in this film was famous actress Audrey Hepburn where she was seen sporting a black Keds Champion. Dirty Dancing (1987) – Being one of the most iconic dance driven movies of all time, one cannot really miss the fact that the leading female character in the form of Baby had white Keds Champion while dancing her way into Johnny Castle's heart. How do you properly clean the Champion Original? Baking Soda Paste - Make a paste by mixing one part baking soda and two parts white vinegar. Scrub the shoe using the mixture concentrating on areas that are really dirty. A larger brush for the upper and the outsole is ideal to use and a toothbrush can also be used to get through the crevices of the shoe. Rinse the mixture with water and let it dry. Mild Laundry Detergent - Mix one to two teaspoons of mild laundry detergent with water on a bucket or sink. Soak the sneakers then scrub with a toothbrush, brush, or wash cloth. Ensure that the canvas gets cleaned, even the outsoles. Rinse it with cold, clean water and let them dry. Dry it initially by simply patting the shoes with a towel. It is important to note not to squeeze or wring the sneakers tightly to not cause permanent damage. When doing these procedures, it is best to take off the laces in order to ensure that every nook and cranny of the shoe can be scrubbed. It is also suggested that before putting any liquid on the shoe, dusting off first to do the initial cleaning can help. There are also different products that can be used to spray to the upper to minimize the adherence of dirt and stain. Initially, the company wants to name the brand to Peds, a Latin term for foot. However, upon registering, it turned out that the name was already taken. As kids were a huge part of their target consumers, the company decided that a better name would be Keds as it has a better recall. How can you spot Fake Keds sneakers from real ones? To ensure that the Keds sneakers you are buying are original, it is best to buy from the brand's or trusted footwear stores and websites. If wary of the authenticity of the shoe, there are some red flag qualities that you should watch out for. One of these is the price. Sneakers that are offered at a significantly lower price can make its originality questionable. Unless it's used or on sale, there can be no reason for a pair to be offered at dirt low prices. For reference, Keds' price ranges vary from $40- $120. Another is the quality and craftsmanship. Since Keds has been in the business since the Industrial Revolution, it is no wonder that they have perfected the quality. This means that the stitching should be impeccable, the fabrics are properly aligned, and the branding should be correctly placed. How did Keds shoes help empower women? Since the brand's launch in 1916, Keds has always been known to be strongly linked to women. In fact, one of its iconic models and its first shoe ever-released, the Champion, got its name thanks to the 1920's tennis ladies athletes. Created history in itself, their shoes empowered women as it offered another option of footwear, a more comfortable alternative to athletic shoes than heels. Aside from that, it was also the first shoe company that offered athletic footwear to women, who at that time did not have same rights as men. Throughout the brand's 100 years of existence, Keds did not only offer feminine styles, but also embodied the mission of empowering women and displaying female leadership. In time for their centennial celebration, Keds also celebrated women with their Ladies First campaign. It features ads like "Oh Girl is the new Oh Boy" and "There is no such thing as an average girl." Where can I buy Keds sneakers? Keds sneakers are pretty much widely available in many select brick and mortar stores. Shoppers who want to enjoy the convenience of online shopping may go to the brand's website and other reputable footwear websites like Zappos, Nordstrom, and 6pm. Charles Goodyear, a chemist and an engineer, has been known to be strongly linked with tires and vulcanization. But, not a lot knows that his invention, which made rubber more durable and long-lasting, also sparked the invention of rubber-soled shoes. Although not the first in the sneaker game, Keds definitely is one of those that hold a significant mark in our history. Keds is a by-product of the footwear companies under the U.S. Rubber Company. In 1916, the largest rubber manufacturer decided to consolidate the shoe companies and named it Keds. Because of its rubber soles, the footwear got the term sneakers, baptized an advertising agency, because it created no sounds and can be used to sneak out. In 2012, Wolverine Worldwide, an American company that sources, designs, manufactures, distributes, licenses, and sells footwear, acquired the PLG Group which includes different brands like Sperry, Stride Rite and Keds on its roster. Other brands under the company are Merrell, Saucony, and Hush Puppies. Currently, WWW is divided into four sections: Wolverine Boston Group, Wolverine Outdoor & Lifestyle Group, Wolverine Multi-Brand Group, and Wolverine Heritage Group. Some of its product offerings include performance outdoor and athletic footwear and apparel, casual footwear and apparel children’s footwear, uniform shoes and boots, and industrial work boots and apparel. Do Keds sneakers run true to size? Based on the general feedback of Keds sneakers, they run true to size. Most of the models are available at sizes 4-13, which is typically a broad range offered for a shoe. Keds also offer four types of widths namely S (slim), M (medium), W (wide), and XW (extra wide). It gives shoppers a wide selection to get their most ideal fit. There are also Big Kid, Little Kid, and Baby sizes that are available for the young ones. How durable are Keds shoes? How long a sneaker lasts depends from one user to another. As different factors come to play, like the aggressiveness of wear and the care placed on the shoe, durability depends on the wearer. Given that proper care is applied, sneakers are guaranteed to last. Can I wear Champion Originals for sports? Looking at the history of Champion, it originated and was made as a tennis shoe and garnered its name due to the sport tennis. In today's time, sneakers from the brand have made its crossover as a lifestyle shoe and are rarely used as a sneaker for sports. Since athletic footwear has evolved, there are many technologies and designs that come into play that can help with one’s performance, type of foot, and even foot conditions. For that reason, Champions are not recommended to be used for sports. Why should I prefer Keds lifestyle kicks over other brands? Each person will surely have a brand preference and there are different factors that come into play when choosing the best brand for you. Canvas sneakers are considered a staple in every person’s shoe rotation. As a result, it seems that each brand, from luxury to mass-produced, has their interpretation of it. Many prefer and are familiar with Keds because of its years of existence. In line with this, a lot have placed the shoe on test and can attest to its quality and comfort. More so, its versatility is something that is proven given that it can easy to spot style inspirations from celebrities and style influencers. Can men wear Keds sneakers? Technically, Keds sneakers are made exclusively for women and children. In essence, there are no rules that state that men can't wear it. To get the perfect size for the boys, it is ideal to go two sizes up and choose the wide and extra wide widths. Pro-Keds can also be another brand that you can look to as it is the athletic brother of the brand.